Our Vision. Our Mission. Our Leaders. Our Members. To live in an inclusive world where every individual is supported, resources are accessible, potential is maximized, and action is inspired. The Special Education Network & Inclusion Association (SENIA) is an association of educators, professionals, and parents whose mission is to advocate for and provide resources/supports for differently abled individuals. Our SENIA members make our vision and mission possible. Kathryn Balsamo has worked at the International School of Kuala Lumpur since 2011 as the Speech-Language Pathologist at the elementary school. She holds a Bachelor’s degree in Speech Pathology, a Masters of Science in Education - Communication Disorders and a Certificate of Clinical Competence from the American Speech Language Hearing Association. Prior to living overseas in Malaysia, Kathryn lived and worked in Baltimore, Maryland in the United States. Regionally, Kathryn has served on the SENIA Board since 2014, holding the position of corporate secretary and most recently as the chairperson. She is a founding board member and co-chair of a local SENIA chapter in Malaysia. Kathryn is a passionate advocate for all individuals and is committed to empowering teachers, parents and related service providers with practical strategies to ensure that the individuals under their care are successful both in and out of the schoolhouse. Outside of work, Kathryn enjoys rock climbing, running, and exploring the world with her family. Now she is the Student Services Coordinator for Middle and High School at Brent International School Manila. As local chapter liaison for SENIA, Priscilla supports the local chapters on their own inclusive journey. She also serves on the board of the SENIA local chapter in Manila and personally experiences the benefits of being a part of a local chapter. Uwe Maurer is the director of Taiwan Sunshine, a non-profit that supports and encourages families that have children with special needs. Uwe is married and the father of three children, one of whom has Cri-du-Chat Syndrome. He is passionate about giving students in Taiwanese and international schools authentic service learning opportunities and bridging the gap to special needs communities. Uwe spent ten years teaching and being the principal Tianjin International School, Shenyang International School, and South Lake International School, Wuhan, in China. In 2006, he moved to Taiwan as the principal of Morrison Academy in Taipei. In 2012 he started a study center in Taipei for children with special needs in Taipei. Currently, Uwe lives in Taitung, Taiwan with his family, focusing on community development projects, specifically employment opportunities for adults with special needs. Uwe has a Master’s in School Administration as well as a Post Graduate Diploma in Education. Brenda Dean is the Director of Student Support Services at Shanghai Community International School (SCIS). She has over 10 years experience as a School Psychologist, beginning in the USA before moving to China. Brenda’s research background has an emphasis in cultural sensitivity in school crisis responses. Her current work experience focuses on developing school response protocols for student mental health concerns, parent and teacher consultation, as well as assessment and intervention for students, ages 3 to 21 years. Brenda believes in living a balanced life, for students and adults. Therefore, in addition to work, she loves to travel and considers herself an amateur photographer. In 2003, Lori’s son Braden was diagnosed with autism spectrum disorder. This milestone event changed her focus from teaching elementary students to advocating for all children and their education. In Shanghai, China Lori worked as a program director for a school focused on students with special needs and went on to co-found the first inclusive school in the city. Currently Lori is running the new Intensive Needs Program which opened up at International School Bangkok this school year. Lori has two graduate degrees; one in Reading Education and the other in Special Education and has been teaching for over twenty years in international schools, including American International School Riyadh, Jakarta International School, and Concordia International School, as well as in the United States in California and Colorado. Tanya Farrol is the Middle Years Programme (MYP) Coordinator at Beijing City International School. Originally from Canada, she has worked as a special educator for over 20 years from Haiti to Egypt, and England to China. She is the awards coordinator and one of the founding members of SENIA. In Beijing, she volunteers her time to promoting inclusion and raising awareness of special education issues for the local SENIA chapter called SENIB. In her spare time, she enjoys traveling with her husband and six-year old son. SENIA was started by a group of international school teachers in China in 2002. The goal was to create a support network for teachers and other professionals working with children with special educational needs in Asia. Over the years we have grown to include other regions of the world. More and more families that have children who are differently abled move overseas–and we are excited to see many students getting support that was previously not available. 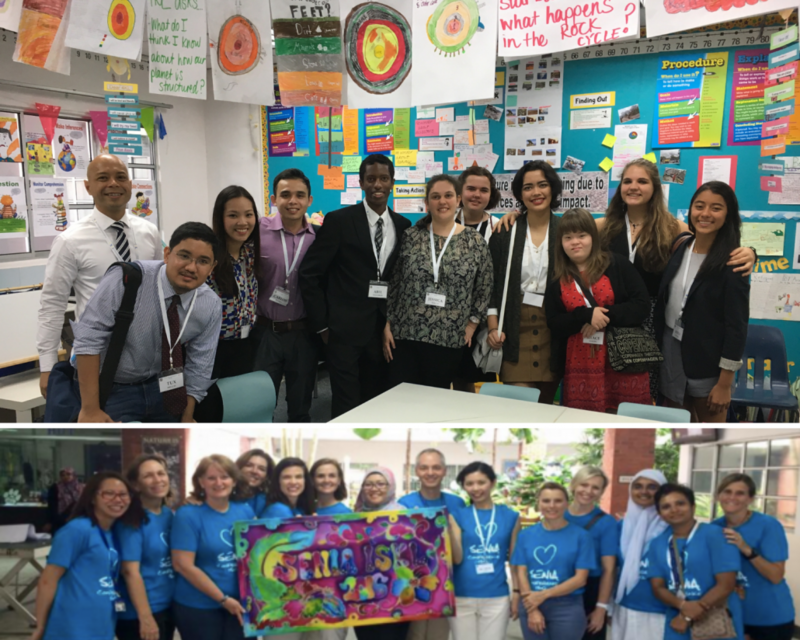 Our network has expanded to include international school teachers, educational psychologists and other specialists, administrators, support assistants, community organizations, and other professionals in the field. Since the early beginnings, our heart has always been advocating for children with special needs. We are excited about the future and thank you for joining us! Our SENIA members are the key to spreading the SENIA mission and vision.